A gentleman brings in his scooter, a 2005 Honda Metropolitan - with only 43 miles on it. He said that he had "us" clean the carb early last year, he put a few miles on it and then parked it and did not touch it. Would not start up, imagine that. Carb clean was in order, common on those machines, but what I found really ticked me off. First, I am not positive the owner did not attempt a repair himself, but he did not say he did, so I'm assuming what I found was caused by a technician that worked for the company when I first started, but "did not work out". Second, after unbolting the seat and base, I found the throttle cable had loose 12mm nuts, never tightened, bad thing. Next, the fuel line was missing it's clamp and one of the coolant hoses was as well. If you do not know anything about slow jets, the bottom half of this one is missing. 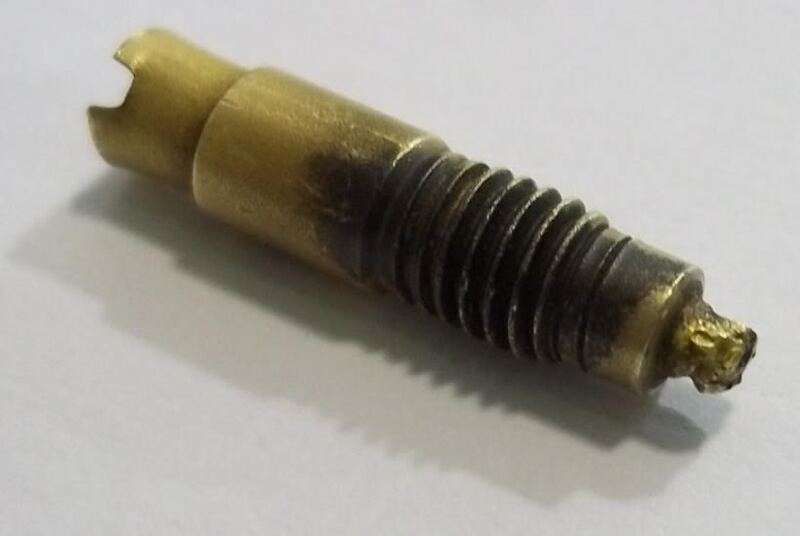 Bad deal, explained why the air screw was only out a quarter turn. Ordered a new one, plus a new main, and a new air screw set and a gasket. Be good as new very soon. Heard tell that tech that I believe did the work is working for another dealership.